Usec. Paras delivering his message during the Meet and Greet with the NMP employees on 23 April 2018. 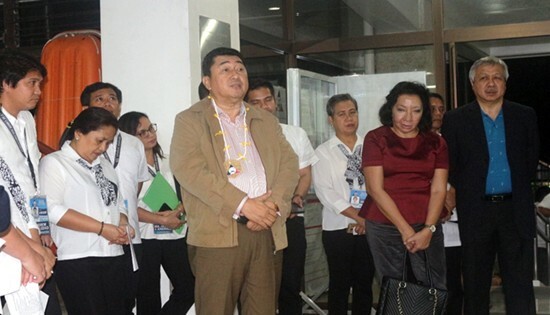 TACLOBAN CITY – “We have heard in the past that there was an attempt on the part of the Department of Transportation (DOTr) to absorb NMP but fortunately with the charm of Assistant Secretary Joji V. Aragon we were able to convince the DOTr through Undersecretary Felipe A. Judan that NMP should remain as part of the human capital development rather than as part merely of the shipping and transportation or whatever the DOTr has planned”, says Undersecretary Jacinto V. Paras of the Human Capital Development, Legislative and Media Affairs, and Administrative Services Cluster of DOLE. This was the categorical statement of Usec. Paras during the Meet and Greet with the employees of the National Maritime Polytechnic (NMP) on 23 April 2018. Usec. Paras stressed that NMP should continue to remain with DOLE, as the NMP’s clientele, the Filipino seafarers, are part of the workforce of the country. The NMP contributes to the attainment of the DOLE’s agenda on Human Capital Development, with the training and research it conducts that ensures the Filipino seafarers to acquire the knowledge and skills required of them to become globally competitive in the international maritime labor market. He also emphasized the need for NMP to move forward and to be true to its mandate as underscored in Presidential Decree No. 1369. NMP has to focus in offering specialization and upgrading courses for both licensed officers and ratings and conducting researches and studies on the latest maritime technologies and other related matters for the maritime industry. Based on the above premise, a paradigm- shift is needed from NMP to come up with a new and true direction as mandated by the law. As such, a series of strategic planning and workshop will be conducted in May 2018. Meanwhile, NMP continues to upgrade its facilities and provide maritime trainings required pursuant to the Standards of Training, Certification, and Watchkeeping for Seafarers (STCW) Convention as amended in 2010 including value-adding courses towards improving the qualifications of Filipino seafarers for their employment acceptability and enhanced competitiveness. Those interested to take NMP training programs may visit the NMP website (www.nm.gov.ph) and its facebook page (www.facebook.com/nmptrainingcenter) where all related information on NMP trainings are available.